A large glazed ham need not be confined to Christmas dinner – this will feed a big gathering of family or friends generously, with enough left for the occasional sandwich. Put the gammon and vegetables in a large pan and cover with cold water. Bring to the boil, skimming off any scum. Add the bay leaf, thyme and peppercorns. Simmer for 2 hours, topping up with water as necessary. Make a glaze by bringing the honey and sugar to the boil slowly. When the mixture starts to foam, remove from the heat and add the madeira. Leave to cool slightly; stir in the soy sauce, mustard and Worcestershire sauce. Lift out the ham to a large roasting tin. Preheat the oven to 170°C/gas 3. Cut the skin away, leaving an even layer of fat. Score the fat in a criss-cross pattern, then stud with the cloves. 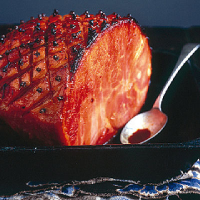 Brush the glaze over the ham and bake for about 1 hour, basting frequently. When browned, set aside to rest for 15 minutes. For the sauce, put all the ingredients except the citrus zests and stem ginger into a pan and bring to a simmer. Cook for 5–10 minutes until syrupy. Remove from the heat and stir in the zest and ginger. Transfer to a serving bowl and leave to cool. Serve with thin slices of the ham. A lively pinot will work well and stand up to the sauce, too.